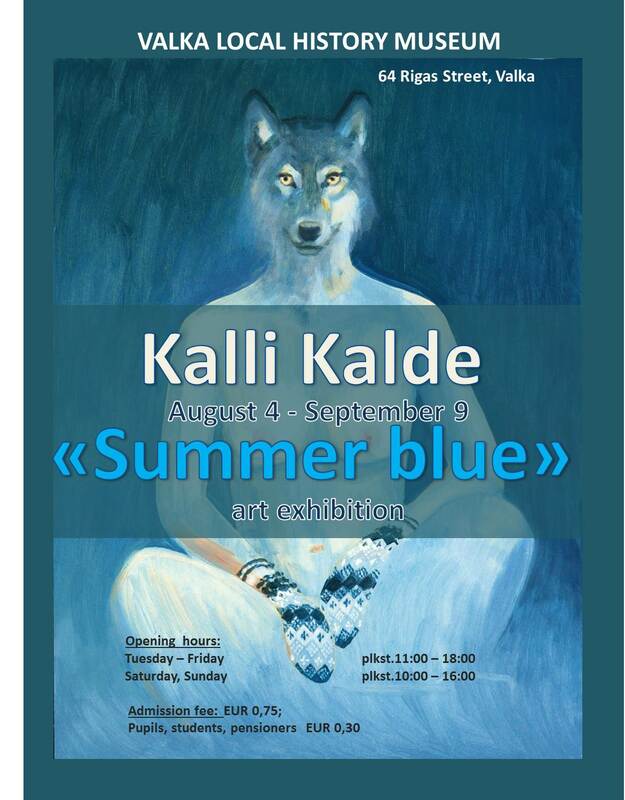 MUZEJS.VALKA.LV - Kalli Kalde "Summer blue"
From August 4, the Valka Local History Museum presents the exhibition of paintings by Estonian artist Kalli Kalda "Summer blue". The exhibition will be open until September 9th. For the last twenty five years I have lived in a small farmstead in South Estonia. I moved to countryside on romantic aspirations, as I value beautiful scenery, nature and open space around myself. Countryside life with its serene and silent atmosphere is a perfect setting for creativity. I live in sparsely populated area, from the windows I can see a lake, a forest and numerous birds and animals. The lake is the first thing I see in the morning. Sometimes I forget my glance on the changing world of water reflections. Really, water has no color, no taste, no form, thus it can take any form, reflect anything, be responsive to everything. In water, there is place for everything, looking at water, you see the sky, the trees, the sun and the stars. But you can also see yourself. Looking at water is a kind of a meditation, an encounter with yourself, with your emotions, thoughts, your past and present. All this is in yourselves: the sky, the clouds, the trees and the grasses swaying in the wind. The water, its ripples and waves are in yourself too. I am inspired by wild nature, I admire beavers swimming around the lake at sunset or the sound of cranes whose calls remain echoing through the forest. As an artist, I concentrate my attention on surrounding environment. I value the fact that my children can grow up surrounded by the nature. What a person sees every day, affects his or her thoughts as well as creativity. A lot of spare time and proper light is needed for painting. I find more time to paint in winter, when the nature is covered with snow and darkness together with freezing temperatures make you want to stay inside. The colder it is, the warmer and brighter become colors on the canvas and paintings get that dreamy touch to them. Somewhere, there is always summer, hot and full of sunlight, even if it is cold and dark in Estonia and lakes are covered with thick ice. Paintings with tropically bright colors bring warmth to the heart and soul in northern frost. The year 2018 is European Year of Cultural Heritage. I have found inspiration from Estonian folklore and folk art, tales of werewolves and mitten patterns. Women in my work sometimes have hid themselves in animals: wolf woman, fox woman. The idea of crawl into the skin of a wild animal gives a way to be alone without thoughts, rest from day work, escape from domestic life. To be alone in the nature, to get familiar with hidden desires, to be one with the universe.